It is a Black Monday for Indian Stock Markets and other world markets crashed as global stocks and commodities extended last week’s steep declines. Nifty and Sensex Crashed around 5.92% and 5.94% respectively. Nifty lost nearly 494 points, Bank Nifty around 1298 points (-7.19%) and Sensex around 1624 points. In the Equity Market FII’s sold Rs -5275.40 Cr worth of stocks and DII’s Bought Rs 4097.83 Cr worth of equities. 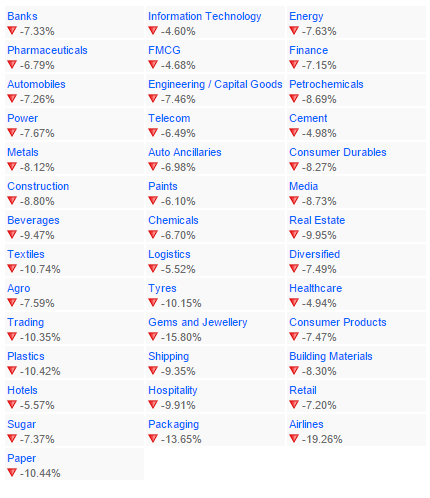 Chinese Market Sell of Followed by European and US stock Exchanges are the key trigger for Indian Stock Market Crash. Nifty Futures lost 6.08% nearly 504 points. Index Futures recorded a turnover of 48,637 crore. All red over the heatmap. Top loosers from Nifty 50 pack are VEDANTA, GAIL, TATA STEEL, CAIRN crashed more than 13%. And Nearly 31 stocks out of 50 crashed more than 5%. 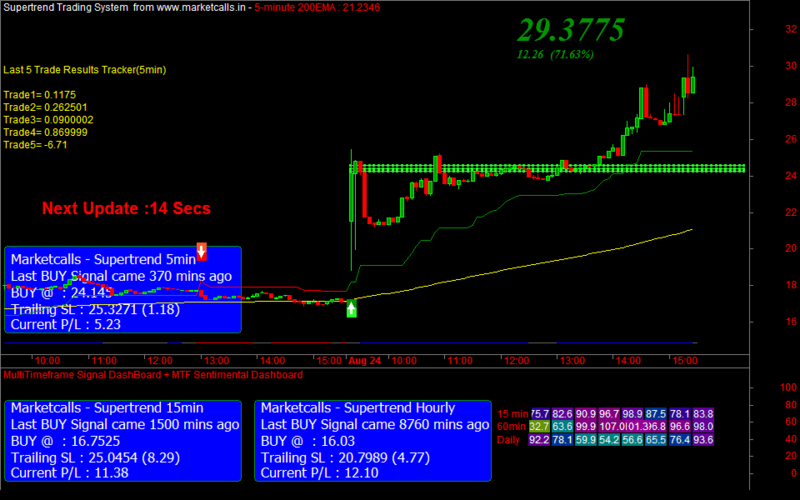 India VIX shooted up 71.63% which is possibly the highest ever intraday VIX movement in terms of percentage. And CBOE S&P500 VIX does an intraday high of 53.29 again highest every intraday VIX movement in terms of percentage. Such higher VIX readings shows sheer uncertainty. 7800PE, 7900PE, 8000PE August 2015 contract recorded huge gains. A Lesson for Naked Option writers who would had taken a known risk at times of uncertainty. Just 3 more days left for expiry and currently 8400CE, 8500CE, 8600CE holds higher open interest. But still no one is confident about the building higher open interest more than 45 Lakh contracts in any given strike price due to ultra steep rise in VIX. 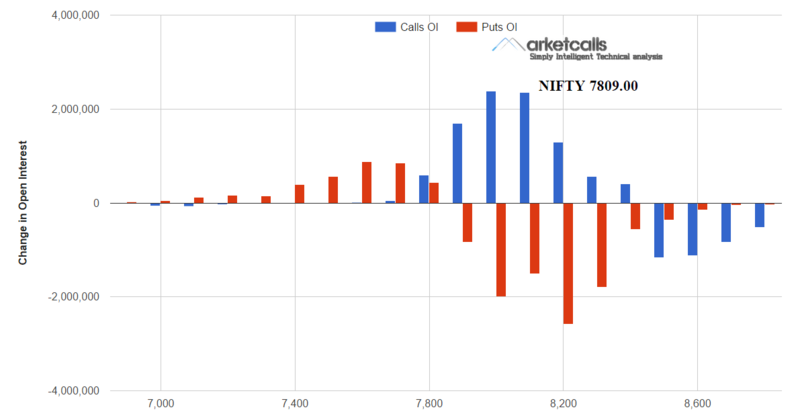 7900CE, 8000CE, 8100CE Option writers added open interest. And unwining seen in 7900PE, 8000PE, 8100PE, 8200PE, 8300PE. Index Option Recorded a turnover of 4.16 lakh crore. COuld you write an article on price range of options specified by exchange. Today there was so much delay in revising the price range by the exchange that the first trade in 8000 PE took place only around 09:42. There were only bid interest and no offer interest in the previous price range which around Rs 13 .4 max !!!!!!!!!!!!!!!!!!!!!!! Where to get the sector heat map , which you have shown ? Taken from Edelweiss Site. We are in the process of preparing our own.